Children’s Worship: We offer an optional time just for the kids (up through age 9) just prior to the message. In the Nursery at about 11:00am. Children can learn about God from the Bible through the use of puppetry, music, crafts, games, and prayer. During our Sunday morning gathering, after our opening music, we have nursery available for children and Children's Church for kids ages through age 9. Prior to the message, kids are dismissed to be encouraged with an age appropriate lesson of their own if they desire. Children are welcome to remain is service as well. All our children's ministry workers are fingerprinted with background checks so you can be sure your precious little ones are in good hands. Faith Community Church supports our local home school families. 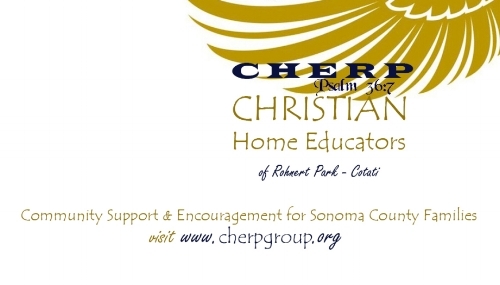 Christian Home Educators of Rohnert Park (CHERP) hosts an open, community cooperative learning program every Friday from 9:00 am - 12:00 pm from February - May, and September through November each year. Find the schedule and current details about this program online @ (cherpgroup.org/community-co-op). Email info@cherpgroup.org for more details! We also host Vacation Bible School as a way of building up the church. VBS provides a reinforcement of the Gospel for our kids, introduces our neighbors to the love and truth of Jesus, and provides an opportunity for youth and adults to start becoming active in ministry, experiencing the blessing of serving others. Our VBS typically runs Wednesday through Sunday in July. Check our calendar for dates!